Runners are a strange bunch. To the uninitiated, sweating your way through 5 to 42.2 kilometres seems like a strange thing to plan your travels around, but a runner will argue: what better way to get to know a city and get to see a little of it while you’re at it? After all, runners are one of the most agreeable, welcoming bunch of athletes out there, and by design a road race will generally take you on a scenic tour of the city. Fredericton’s one of the best cities in the Maritimes to do a road race in. For one thing, most of them wisely stick to the flat riverside and downtown areas, making for fast and scenic routes. This is good for both serious runners looking for a “PR” (personal record) and for those of us just hoping to survive the race. More importantly, Fredericton offers a selection of off-beat races designed to entertain and exercise. Not a runner? No problem. You’ll probably be able to walk 5k in under an hour, and walkers are welcome at most road races too. My guess is that you’ll even find yourselves walking with some locals who’d be delighted to tell you about our town during the walk. 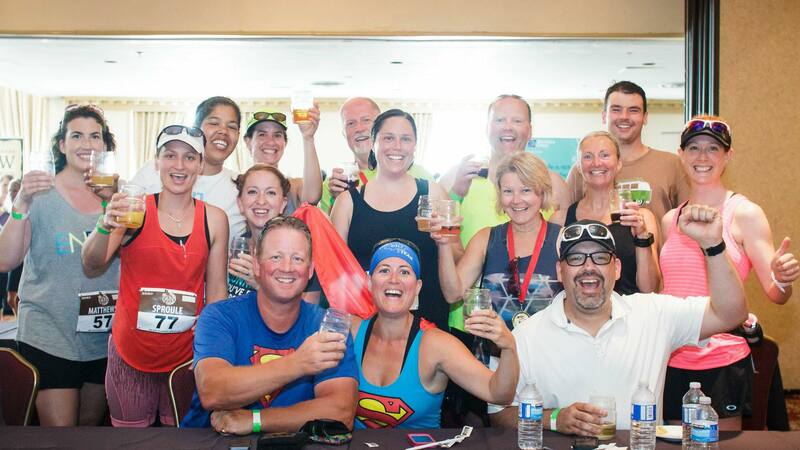 With both vibrant craft brewing and running communities, it’s only natural that Fredericton should offer the chance to combine these two passions Of course, a quirky beer run needs quirky distances, and so you’ll have your choice of .5km, 1 mile, 5km or 12km races. New this year is the .5km Donut Dash (yes, you heard right!) – at the .25km mark, carb load on some donuts then head back as it’s the halfway mark! Registration gets you a custom designed beer glass, medal, custom bib and (bonus!) access to the Down East Brew Fest! Cheers! Get ready to cross streams, bridges and some uneven surfaces! It’s all worth it as it’s in beautiful Mactaquac Provincial Park. The distances are 10k and 20k and its mid October which means you have bonus fall scenery as a backdrop! New this year, race organizers are environmentally friendly and are going (almost) cup-less! There will be no cups at the water stations BUT as part of the race swag, you will receive a reusable, foldable cup which will be ready for you to use on race day! How cool is that! If you’re one of those people that says “I only run if something’s chasing me!”, this is the race for you. Start out this 5.5km run with three flags and do your best to keep the zombies from stealing them before you cross the finish line. Costumes are encouraged, and if you really don’t like running, you can even register as one of the zombies! Appropriately, the Running Dead race is a few days before Halloween, and all proceeds go to the Fredericton Sexual Assault Centre. Click here to register! Quirky isn’t everything. For a, well, classic road race experience, check out the Fredericton Fall Classic. With distances from the 5k to the half marathon, the Fall Classic is a well-organized and long-running (get it?) road race now in its 36th year. This route really showcases Fredericton’s amazing urban trail system, starting downtown and then winding along the trails north of the city. If you’re a runner looking for a PR, the cooler temperatures in September combined with a flat course make this a good bet… but don’t run so fast you forget to check out the scenery! Whether you are in it for a personal PR or just want to experience something different in a run, I hope you try one (or two! ) out – it makes for a great story! Kate O'Rourke spent the first twelve years of her life in Ontario before moving to Nova Scotia, and considers herself “an Upper Canadian in full remission”. After travelling to far-flung places like India, Costa Rica, South Africa, and Ireland and living in Tanzania and Calgary, Alberta, she was lucky enough to settle in Fredericton in 2013. Blogging as The Maritimer, Kate shares her local travel insights covering food, events, attractions, family-friendly activities, accommodations… and the best places to go for a run!